Young children are naturally very self-centered. This is a normal part of infancy and toddlerhood, but as children get older it’s important that they start to notice the needs of people around them. As I said in the last grace and courtesy post, this typically begins with family and friends. Once children start studying other countries and cultures, the idea of grace and courtesy can take on wider parameters. Finding ways to contribute to the community is a favorite activity of young children. It takes their focus of off themselves and provides a sense of belonging and satisfaction. Activities can be as simple as picking up litter from a park, bringing food to a food pantry, recycling, or visiting senior citizens. Older children can volunteer at various community centers, or organize larger projects such as fund-raising for worthy causes. Some schools I’ve been at have had food drives for local food pantries, held bake sales to raise money for charity, or visited retirement homes at holiday times to sing to the elderly. Whatever activities they choose, it’s important that they understand what they are doing and why. Take a few minutes before a field trip or when planning a fund-raiser to talk about what they are doing and how it benefits other people. One very important aspect of grace and courtesy is talking about the correct way to treat plants and animals. When I was a 3-6 assistant, one little boy took a hole punch from the art area and started punching holes in the leaves of a plant. The other teacher and I were shocked, but we realized that he was driven by curiosity. Rather than getting angry, we used it as a “teachable moment” for the whole class. We talked about the ways that plants help us (providing oxygen, shade, food, beauty, homes for animals, etc.) and why we should respect and care for them. Kindness towards animals is very important too, and it’s nice to have some animals in the classroom or home so that the correct way of caring for them can be demonstrated. Care of plants and animals has a global application – children are usually interested to learn about the destruction of the rain forest and various animals that are on the verge of extinction. They may decide to get involved in one of these causes if they desire, by writing letters, educating friends and family, or raising money. Taking children’s efforts to a worldwide level is the goal of the elementary classroom. First comes knowledge; children must know the world to be able to contribute to it. Geography, civics, history, cultures, and science are such important foundational studies. Travel – as a family or a class – is an incredible way to learn about new places. Exchange student programs are a wonderful way to accomplish this; one Montessori school where I worked had an exchange program for 6th graders. They would spend part of the year in Japan, and children from Japan would visit us for part of the year, since the children at our school studied Japanese starting in first grade. A classroom or family can support a child (or two) through one of the many child support agencies (World Relief, Compassion International) and write letters or send postcards to that child. It’s a great way for kids to learn more about another country and culture, as well as to let them see firsthand that most children around the world do not have the blessings that those of us in developed countries do. 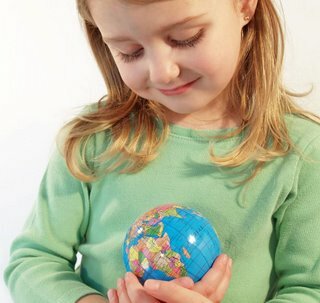 The child’s family and classroom is really their microcosm for understanding how the global world interacts. If they can learn conflict resolution and communication skills in a smaller, comfortable environment, they will be able to use those same skills when they are in college, starting a new job, traveling, or organizing a group of people. It’s very difficult for those skills to be learned in adulthood; the time to start is with youngest children. Children will imitate what they see, so make sure that your own attitude towards others is generous, kind, and forgiving. Kids are always watching!